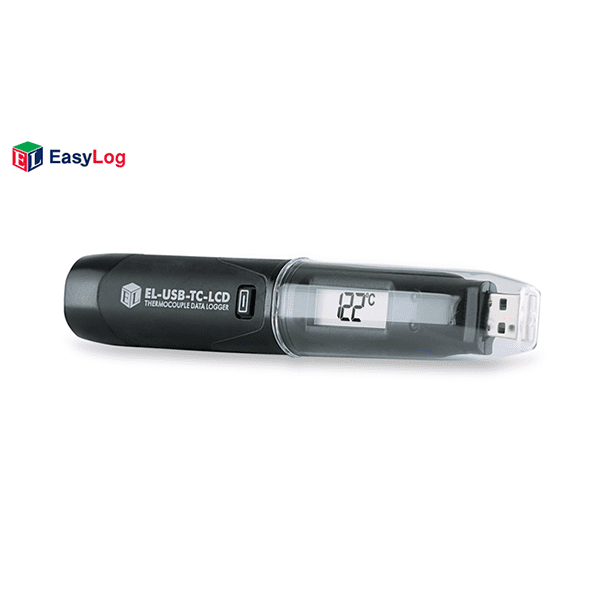 The Lascar EL-USB-TC-LCD USB Thermocouple Data Logger is a standalone data logger that measures over 32,000 readings from inter-changeable J, K or T type thermocouples. Supplied with a K Type Probe, its measurement range out of the box measures from 0 to 200°C (-32 to 392°F) range. At the touch of a button, use the onboard display to cycle between the current, minimum and maximum temperature logs seen during the session. Easily set up the logger and view downloaded data by plugging the unit into a PC’s USB port and using the free EasyLog software provided. Data can then be graphed, printed and exported to other applications for detailed analysis. Supplied with ½ AA battery, K-type probe, and wall mount clip. * Operating temperature applies to the data logger module only. Please consult the probe manufacturer for operating temperature of thermocouple. ** Quoted accuracy is for the data logger only and excludes the thermocouple probe. Thermocouple error should also be taken into consideration. *** Depending on sample rate, ambient temperature and use of LCD.